This UV-adhesive is crystal clear. This UV-curing adhesive is crystal clear, relatively thin in consistency and shows good capillary action with glass up to 6 mm thick, due to its high sensitivity to UV light, it is ideal for bonding laminated glass to: glass, laminated glass, metal, wood, stone as well as to many thermoplastics. 85 g per bottle. 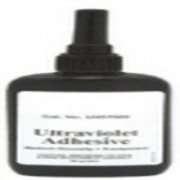 UV Adhesive 602. This UV-curing adhesive is crystal clear, relatively thin in consistency and shows good capillary action with glass up to 6 mm thick, due to its high sensitivity to UV light, it is ideal for bonding laminated glass to: glass, laminated glass, metal, wood, stone as well as to many thermoplastics. 85 g per bottle.